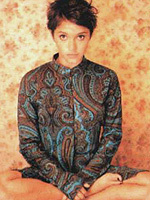 Emma de Caunes is a big star in her native France, although all she has been in has been indecipherable French Cinema. I suppose that would make sense, seeing as that seems to be what the Europeans enjoy. At any rate, she has been in a whole crapload of movies that I can neither say nor spell since her debut in 1996.